Teeth should be replaced immediately after a tooth extraction. Without your teeth, you may have difficulty speaking or eating properly. The surrounding teeth may begin to shift and move to fill the space, resulting in problems with your bite and the appearance of your smile. Even back teeth should be replaced as soon as possible. Dental implants not only restore the appearance of your smile, they offer a permanent replacement that looks and feels just like your natural teeth. Unlike dentures, implants never shift nor do they require special adhesives or cleaning materials. No one will know that you have artificial teeth. Made up of an implant post which integrates with the jaw bone, an abutment and a crown, dental implants function much like your natural teeth. The post serves as the root of the tooth, supporting the entire implant and stimulating the jaw bone to preserve bone health. The crown is designed to look and function like a natural tooth. 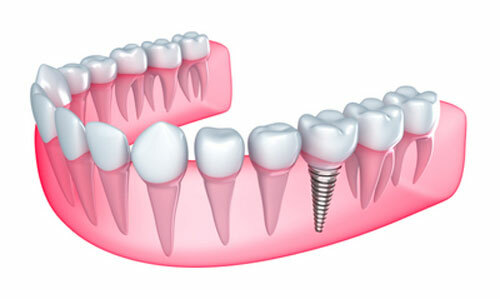 After a tooth extraction, a dental implant is an excellent substitute for your lost tooth. To schedule your personalized consultation in Glendale, AZ for dental implants, contact Dr. Michael Allard today.